How Will Blockchain Change the Way You Do Business? It is one of the most talked about innovations in technology and could feasibly change the way we transact business in all aspects of our lives. Blockchain has the potential to revolutionize almost every industry including the supply chain, governments, healthcare systems, education, voting, banking and more. You’ve undoubtedly heard of Bitcoin. In the simplest of terms it is a virtual currency; but it is also the platform that tracks who owns how much of it, and what was purchased with it. The Bitcoin platform, invented in 2008, is the advent of blockchain technology and is the unique way in which Bitcoin transactions are recorded using encryption and a decentralized shared ledger on a peer-to-peer network. Looking at each piece of the puzzle may help readers understand how blockchain works and how it differs from the way data is being used today. 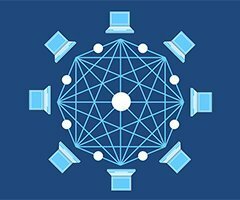 Blockchain uses a shared ledger. A ledger in this case, is very similar to an accounting ledger; it is a record of transactions. But rather than each participant in a transaction keeping their own set of books, there is a single shared ledger. All participants have access to the same information. The shared ledger is not owned by a central authority like a bank. Instead it is a public record accessible by anyone who chooses to participate on the peer-to-peer network. * Typically, users will not interact directly with the network, and will instead go through a wallet application to interact with cryptocurrency. The easiest way to directly get involved with the peer-to-peer network is to operate a miner, which helps authenticate and validate transactions on the network. The ledger is replicated on every computer or node containing the software. Whenever a new transaction is made, all nodes are updated throughout the network. * Blockchain can be implemented on a private network in which case only those with network permissions can view transactions. The records on a blockchain are secured through cryptography. Network participants have their own private keys that are assigned to the transactions they make and act as a personal digital signature. The name itself, “blockchain”, is a description of how transactional information is stored in the shared ledger. Each transaction is its own block of data. 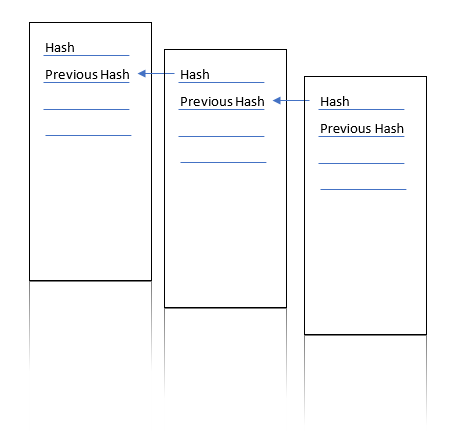 It contains a unique ID called a hash (cryptographic fingerprint unique to each block) as well as the hash of the transaction that occurred immediately before it. In this way, transactions are kept in chronological order. 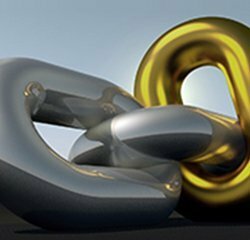 As you just read, transactions in the blockchain are chained together. Because of this, a transaction cannot be deleted nor can a transaction be inserted. If an error is made in a transaction, a new transaction will need to occur to reverse the error and fix the problem. A shared ledger means that everyone involved in a transaction has access to the same information. Not only does this eliminate the potential for errors that could occur when each party keeps its own set of information, it also ensures transparency. It is nearly impossible to tamper with the data because all parties are able to see all transactions. Because they aren’t contained in a central location, blockchains don’t have a single point of failure and cannot be changed from a single computer. Even if an ambitious hacker were to attempt to change a transaction, it would require massive amounts of computing power to access every instance (or at least a 51 percent majority) of the blockchain and alter them all at the same time. If a user attempts to alters a record, their signature will become invalid and the peer network will be alerted. In the relatively short time since Bitcoin was invented (2008), blockchain has grown and evolved. Ethereum, another cryptocurrency and blockchain platform started in 2015, added an element to blockchain technology called “smart contracts”. A smart contract is a self-executing contract which allows transactions to automatically occur based on a given input. Whereas the Bitcoin blockchain platform is limited to transferring cryptocurrency, smart contracts on the Ethereum platform allows the transfer of any digital asset thus expanding the usefulness of blockchain technology. Ethereum became one of the first open platforms for developers to build and deploy applications using blockchain. More recently, many large players have entered the blockchain space. Companies like Amazon, Microsoft, IBM, R3, JP Morgan Chase are creating blockchain platforms and participating in collaborative efforts to further advance blockchain in the business world. Whereas Bitcoin and Ethereum were purposely created for use on a public, permissionless network, blockchain for business is now also being implemented on private, permission-based networks adding yet another element of security. Blockchain platforms such as Ethereum, Linux’s Hyperledger project, Microsoft’s Azure Blockchain Technology and Amazon’s Blockchain Services, are making it easy for businesses to take advantage of this technology. These Blockchain As A Service (BaaS) companies provide a platform and resources for developers to create new and exciting applications that benefit from the high security of this technology.